Hello Games’ procedurally generated space explorer No Man’s Sky is about to get a huge update, adding several much-requested features including unlimited base building, improved visuals and, most importantly, multiplayer. No Man’s Sky NEXT launches on July 24th and looks to be a complete overhaul of the game experience, bringing fundamental changes across the board. You will be able to team up with friends or strangers online, build shelters and colonies together, get into spaceship dogfights, and even build race tracks and trails on alien terrains which can be shared with other players. Interestingly, Hello Games’ statement on the update also says that you will be able to ‘help friends stay alive, or prey on others to survive.’ How exactly this will take form is unclear. Will you have to actively search for other players in multiplayer lobbies? Or will you organically encounter players in a similar way to Destiny? Do you want to boldly go where no man has gone before? Check out our best space games. Next there is the visual upgrade. No Man’s Sky’s alien worlds have been given a fresh coat of paint, with improved planetary terrain generation, ground textures, water and clouds. The update also adds the ability to explore the game’s many worlds in third-person, adding a greater incentive to customise your player character. Space environments and NPCs will also benefit from visual improvements. Oh, and some planets now have rings, if you’re into that kind of thing. NEXT will also bring more things to do, drastically expanding the games’ base-building mechanics with the ability to build bases anywhere, on any planet. Bases can now be bigger and more complex, with hundreds of new building pieces coming with the update. Finally, Command Freighters will add a new batch of tactical objectives to your personal space conquest. You can assemble and upgrade a fleet of frigates and command them from the bridge of your freighter, or deploy them to assist you in your interplanetary exploration. Hello Games have also invited players to bring ‘friends aboard and take on challenging multiplayer missions from the Galactic Commision Station on your bridge’. We don’t really know what these missions will entail but it’s safe to assume they will involve gathering materials in weird alien worlds. No Man’s Sky generated a huge amount of buzz prior to release for its ambitious mechanics and gorgeous art design, but post-launch, it became one of the most contentious games of 2016. Many players were disappointed with the game’s lack of content and apparent visual downgrade from early trailers. 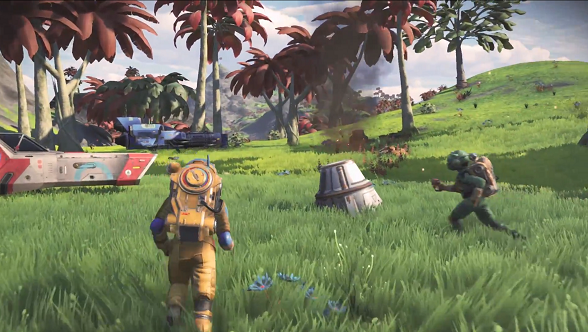 Most controversially, several features which were teased or outright confirmed by game director Sean Murray were missing from the game, such as the ability to encounter other players. Hello Games’ dedication to delivering on the game they set out to make, even so far on from release, is admirable but it remains to be seen whether this hefty update will do much to repair the damage done by the game’s messy launch and pique the interest of new players.